This is the primary degree in geosciences and the one recommended for most students. This degree offers the best opportunities for employment and the best preparation for graduate school in geosciences. Our courses are divided into two tracks. You can graduate with any mixture of courses from the two tracks. You are in fact encouraged to take courses from both tracks. These courses focus on the solid earth. Classes focus on topics such as rocks and minerals, earth history, and mountain building. Employment sectors in this area include mining, oil and gas industry, and government agencies. These courses focus on the earth’s surface, water and climate. Classes focus on topics such as rivers, surface and groundwater, snow and ice, and climate change. Employment opportunities exist doing environmental consulting and hydrology with government agencies and private companies. In addition to the standard Geosciences B.S. 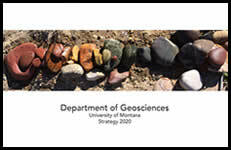 degree, which is pursued by most of our students, we offer a Geosciences B.S. degree with an Earth Science Education concentration, for which students must be admitted to the Teacher Education Program and complete professional education licensure requirements. This program offers dual degrees from UM and universities in Germany and Ireland. For more information, please see the UM Catalog (below) and the International Field Geosciences website. International Field Geosciences Dual B.S. International Field Geosciences Joint B.S.